Welcome to December, Chickens! I hope you have recovered successfully from Thanksgiving excesses and are now ready for the month of festivities that will take us from now to the New Year. Since we are all busy and frazzled being joyful at this time of year, I have decided to devote December to nibbles, bites, tricks and tips. Small little snacks, that don't take too long to read, with excellent advice, simple to prepare recipes, and good gifties. If you need more than a snack, be sure to check here for my mega foodie gift idea post. I have decided to dub it Snacember. Every day this month will have a small snack from me, and I hope you will schedule a couple of minutes a day for us to have a little snack break together in all our holiday madness! Reuseable shopping bags, like Baggu Bags or Envirosax for holiday gift giving! I love these colorful nylon bags for shopping. They come in singles , or packs of 3 or 5, fit easily in your purse or pocket, have sturdy handles that go over your shoulder, and make shopping (especially for groceries) a fashionable and comfortable experience. The sets make for a great gift in their own right, but I think the bags are a terrific alternative for those fancy paper giftbags we all spend way too much on! Baggu makes bags in several sizes, and giving your holiday gifts in them will make you feel all virtuous and green and planet friendly. 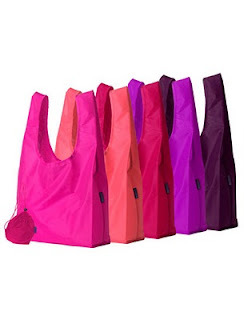 The smaller size, (ideal for books or small gifts) are only $6 each at http://www.baggu.com/ and come in great colors, and are the perfect size for a quick trip to the grocery for a few little items. The larger bags are $8, $6.50 if you buy 6 or more, and can fit a larger gift like a board game, and will replace a full size traditional paper grocery bag. Considering that by the time you add up the cost of a fancy gift bag, tissue paper, and ribbon you can easily spend that or more on stuff that will get thrown away, giving a gift in a bag that becomes an extra bonus present seems almost a moral imperative. I spent my whole wrapping paper/ribbon budget this year on a rainbow of these beauties! Go green, (or pink or blue or purple or polkadotted) and give out your holiday goodies in a container that they will use over and over. Probably the best idea ever!! I"m going to use this! Thanks a ton! such a great idea! especially for people that live in the city and must carry their groceries a few blocks/up a few flights of stairs. any suggestions on slightly smaller enviro-friendly products to package holiday snacks (cookies, chocolates etc) as gifts? I like Snapware, especially the glass ones, for giving foodstuffs. Sturdy enough to keep everything safe, and then a nice storage container after the nibbles are gone. For less pricy items, I hit the restaurant supply house and buy white Chinese food takeout boxes in different sizes. They are disposeable, but at least they are recycleable! And very cheap. Those bags are such a great idea. Wrapping paper, ribbon, bows and gift bags can add up really fast! Thanks for the info! I use the Chinese takeout boxes ( purchased mine in many colors at Michaels craft stores ) for giving holiday ornaments as gifts. Perfect size and reusable also. just received a set of Baggus to use for wrapping. LOVE this idea! please post more! These totes are the best! A friend of mine came to Italy last year to visit after an online reunion and not seeing each other after 25 years. We celebrated our 40-year friendship & reunion shopping (what else). I found the pasta maker of my dreams in Siena and she whips out one of these bags. I thought it was the coolest thing ever, and she left it with me in Italy when she went back to Pittsburgh. It stays in my purse now, and whenever I have an 'impulse' purchase - like the bread attack yesterday in BF southern France, I now whip this out and think of her. It really is the gift that keeps on giving!